Perfect for sharing. While Trough 48 is the ideal size for larger bathrooms - with plenty of room for two -you may find yourself seeking alone time just to delight in this trough bathroom sink's sublime hammered copper texture and cherish its Handcrafted beauty. Trough 48 perfectly combines the functionality of two sinks with the beauty, style and easy maintenance of one. 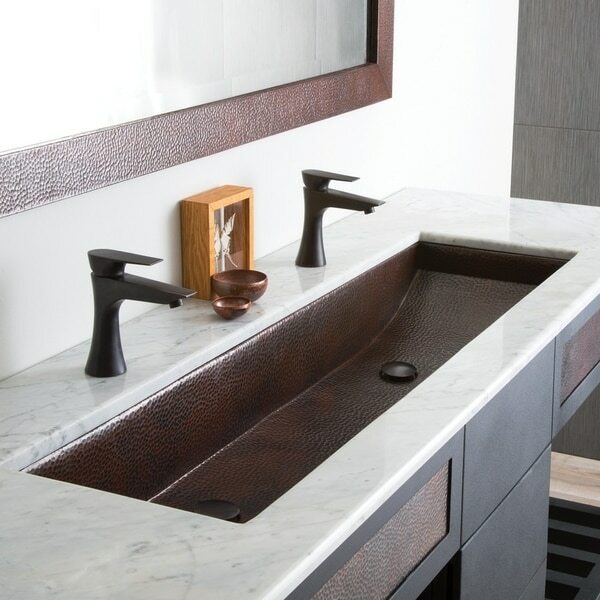 Trough 48 copper bathroom sink is artisan crafted; forged of high-quality recycled copper. Copper has been used for centuries in kitchens and baths throughout the world; Trough 48 brings modern functionality to a classic material. Dimensions 48.0 In. X 14.0 In. X 6.0 In.